Life is too short to stay on the pavement.. WOW!! I have to say this road is probably the most diverse drive that I have been on. 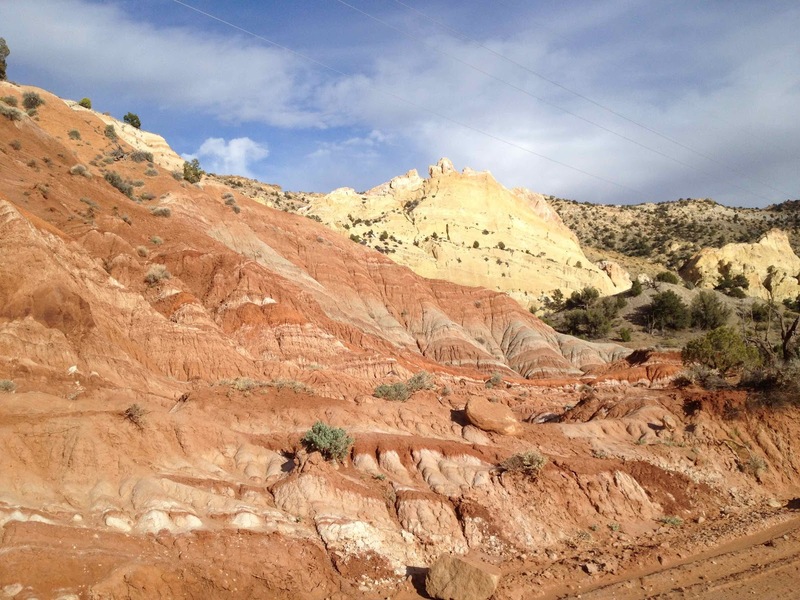 Very unusual geological formations and terrain. 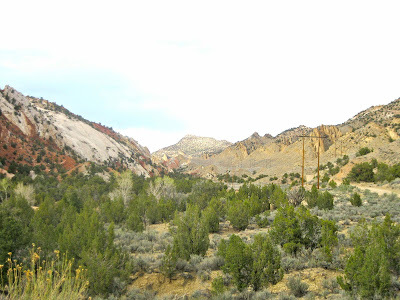 I had not expected to be able to get all the way through the canyon, so I did not notate the mileage very well but I still think my descriptions will be helpful to you. 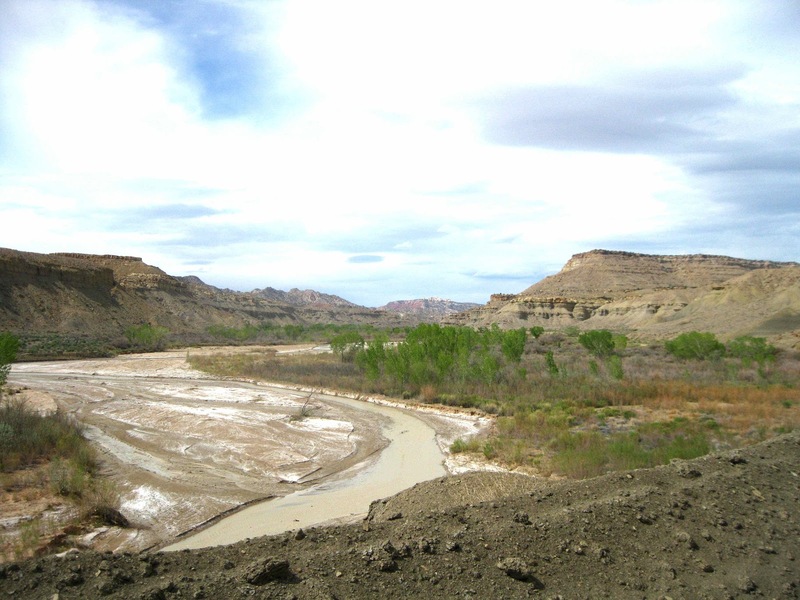 I was staying in Page, Arizona and spoke to the Rangers at the Big Water, Utah BLM office where they have some interesting information about dinosaurs and the rock layers of the Grand Staircase. 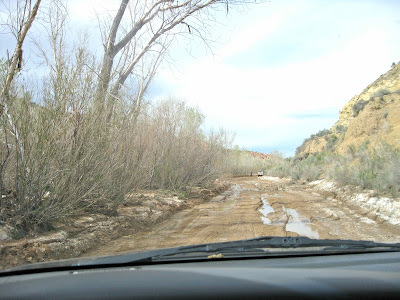 One Ranger there advised me against doing the Cottonwood Canyon road with a low clearance vehicle. The other said that it was possible but that the road was washed out and closed 15 miles in. I decided to go in a few miles and check it out for myself. The turnoff of Highway 89 for Cottonwood Canyon (Rd.400) is around mile marker 18. There was a big sign at the beginning that said that the road was closed 15 miles ahead, I ventured ahead anyway. The road started out with a few small hills, then was basically flat, barren & boring. It was just gray shale without a lot of vegetation. I was tempted to turn around but saw a small bit of green ahead where it looked like the road might drop down to be more of a canyon so I decided to go at least 5 miles. 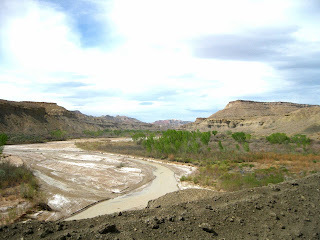 At around 5 miles I could see the Paria river and that the road dropped down, remained soft and smooth so I continued. I wasn’t overly impressed with the river, but there was a little change in scenery and I could see some interesting pink, red and white rocks further down the canyon, so I kept going. The road would go near the river, then wind up, around and through some unusual rock layers and formations. For the most part the road followed the power lines and was soft and level. Being out here with no other cars and going through a variety of different rock formations that you wouldn’t normally see made it seem a bit other worldly. When I hit the 15 mile mark, I expected that I would need to turn around but the road was fine so I kept going. At around 19 miles in, I found where the road had been washed out but I also found a local rancher who was about to drive through the ‘closed section’. There were no road blocks or anything at this point it was just muddy. I talked to the Rancher who told me that this 200 or so foot section was the only bad part of the road all the way to Cannonville. He thought I would be able to make it through this section if I used my 4WD and that if I didn’t he would pull me out with his truck. I pondered a moment then went for it and I am glad that I did! I think the most beautiful parts of the road were beyond this section. There were some red, white and pinks on the road prior to this but the canyon becomes a little narrower and the rock formations just seem more dramatic. They were several hiking trials going forward, two at ‘the Narrows’ which appeared to be slot canyonish and being there was a chance of rain and I had not planned on coming this far and wasn’t sure how long it was going to take me to get back to Page, I did not explore them. Kinda looks like a tilted pizza! I did stop at Grosvenor Arch, which was pretty cool. The turnoff for the arch was around mile 29. It is a quick jot down the the arch were there is a parking area and signage. 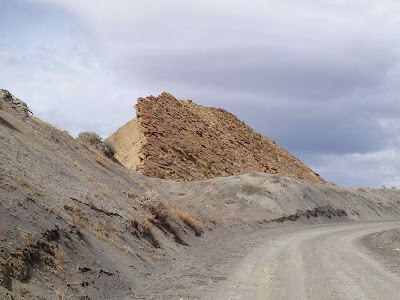 The Cottonwood Canyon road at this point gets out of the weird rock layers and is more open sage brush type terrain with wide sweeping views. 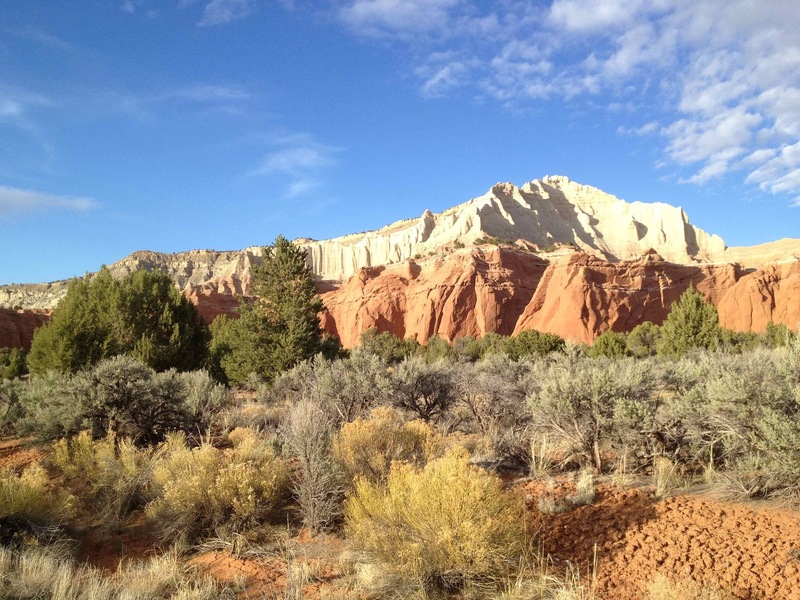 The vegetation gradually increases and changes to bushes and pinyon pines until you drop down to pavement. Once you hit pavement, Kodachrome State Park is too the right and well worth the side trip. It was getting close to sunset by the time that I got here and the light rays on the colored rocks were awesome. I would have liked to stayed and explored a bit longer. The quickest way back to Page would have probably been the Cottonwood Canyon road but since I didn’t want to attempt the washed out section alone and possibly in the dark, I chose to take Skutumpah Road (Rd. #500) to Johnson Canyon Rd to Highway 89 to get back. This road comes in before you get to Cannonville, so I did not make it there. The Rangers had suggested I take this route to go see Kodachrome. I actually found the north side of this route much more rutted than anything on the Cottonwood Canyon Road. There are some high points on the north end of this road that give you nice views back towards Kodachrome. The southern end of Skutumpah is just gravel and this route when dry is fine for a low clearance vehicle. Overall, the Cottonwood Canyon road was very unique and I would do it again. The road was fine for a passenger cars as long as it is dry. I would not have attempted going through the washed out area of the road without 4 wheel drive and someone with a big truck and chains to pull me out present. I did this route in late April. I expect the road will dry out at some point and they will take down the signs. If you are on the north side near Cannonville, the road is worth the drive down towards the Narrows and where the washout occurs. 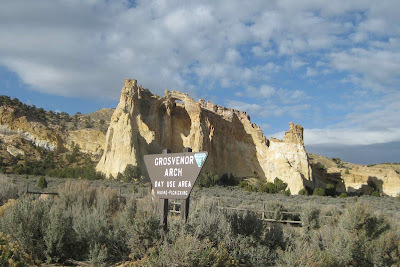 I would definitely plan on making stops at Grosvenor Arch and Kodachrome State Park while in this area. The Last Dollar Road, located in South Central Colorado between the towns of Ridgeway and Telluride, is one of my favorite unpaved drives. It isn’t always ‘less traveled’ and it isn’t necessarily passable in a passenger car after heavy rains or when snow has fallen. It is especially beautiful for flowers in late June and for fall colors in late September. From pavement to pavement, this route is about 18 miles. 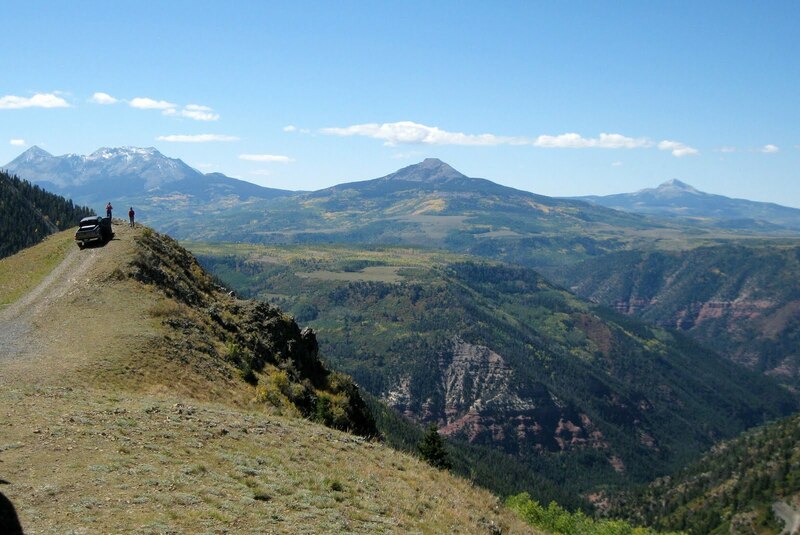 You can start from either end but I usually start from Ridgeway and go south to Telluride. You can find the Last Dollar Road turnoff on Highway 62, 12 miles from the only stoplight in Ouray County at the junction of Hwy 550 and CO. Hwy 62 in Ridgeway. There is a small Forest Service sign at the turn off, saying "Last Dollar Road". 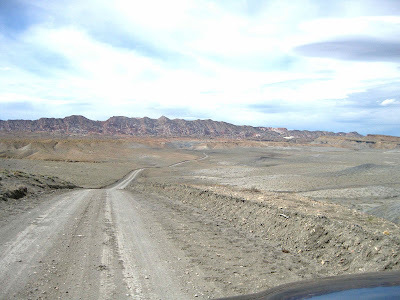 The road begins as a basic gravel road that winds through some large ranches. At this point there are wide open views of open ranch land and of the Sneffels Mountain Range. After 5 miles on the gravel road, there is a turn off to the left that is labeled Last Dollar and Rd 58P. You take this road to the left. (The road to the right goes to the town of Sawpit on CO. Hwy 145.) You will head downhill as you turn left and the road will become narrow and more rocky for about one and a half miles where you reach a water crossing. It can be anywhere from a small trickle to a couple of large puddles and a small stream. I have been concerned a few times about the water here but have never actually had a problem. Though the puddles sometime may be large they have never been very deep. After you pass through this area you start to climb gradually and the road opens up more but it can be very rutted and muddy after hard rains. You again begin to see mountain views and after a few miles start to climb into pine forest. You will start to alternate pretty quickly between aspen groves and pines. In the fall it is hard to decide which aspen grove is actually the prettiest. At 9.3 miles from Hwy. 62, you reach a look out point where you can see the red canyon walls that Hwy 145 to Telluride runs in. 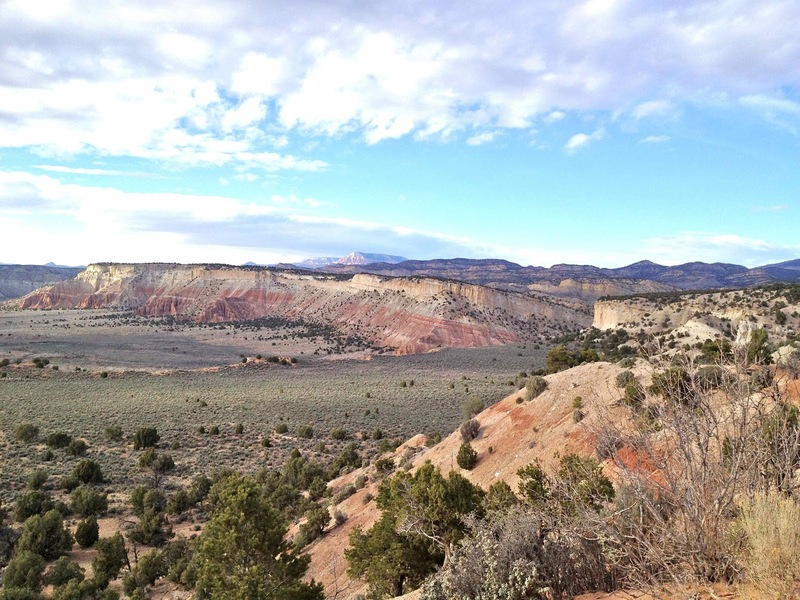 On clear day, off the the northwest you can see the La Sal Mountains near Moab, UT. 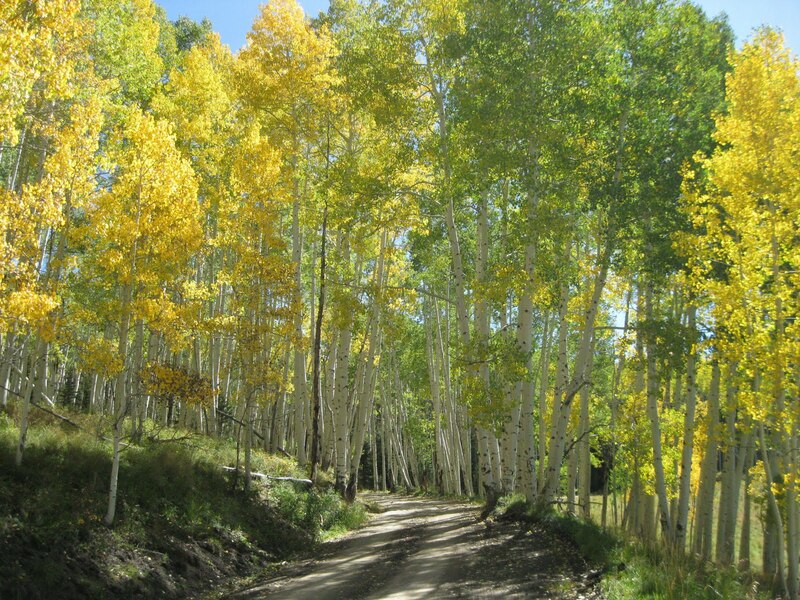 You’ll see more pine forest and aspen groves and some dispersed camping sites as you climb to the highest point of this road which is at 10.5 miles from Hwy 62. At the top you will find the Alder Creek trailhead and several dispersed camping spots in the pine forest on both sides of the road. This is a great place to stop and enjoy some lunch. From here the road is all pretty much downhill. 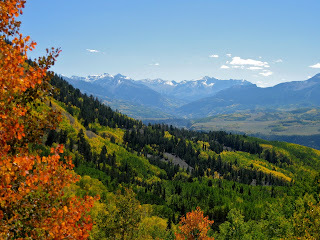 The views toward Mount Wilson and Telluride to the south are fabulous. In late June the hillsides here are filled with flowers. 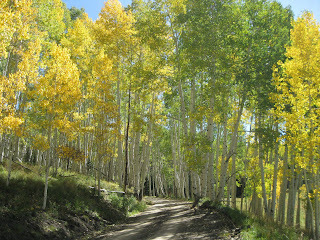 In the fall the aspens on the hillsides are beautiful. As you get down the hill, there is another small stream crossing, that has never been a problem for me. Further down you will find a rock slide area that can be easily crossed . At 12.4 miles from the Hwy 62 turn off you are basically down. The road turns to nice gravel as it starts to wind through ranches and homes. The houses here are in the multi-million dollar range. Tom Cruise has a home high on the eastern mountainside, but I have never been sure which is his. 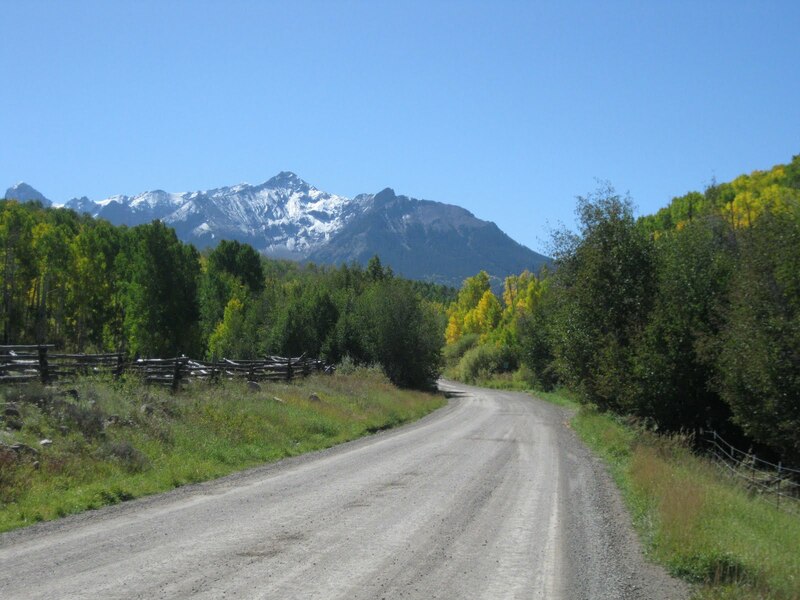 It is about 6 miles of nice gravel and nice views before you meet the pavement near the Telluride airport. To get to Telluride and Hwy 145 you go to the left. To the right is the airport. Telluride has lots of shops to explore. The Bridal Veil falls can be found on the south end of town. There is a free Gondola, that is dog friendly, that will take you up the mountain or over to the Mountain Village ski resort area. If you get off on the top of the mountain there are great views of Telluride and the surrounding mountains. 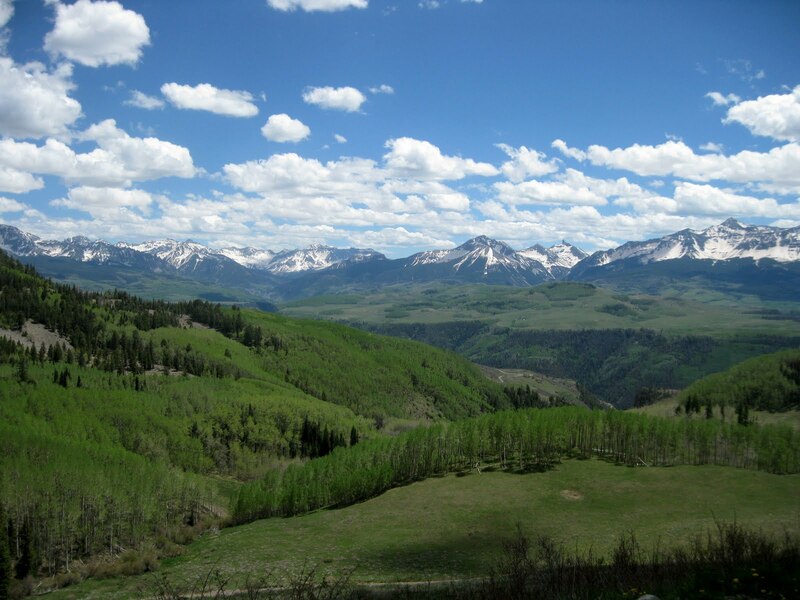 You can return to our starting point in Ridgeway by taking Hwy 145 out of Telluride to Hwy 62 East. This route is part of the San Juan Scenic Byway and very beautiful as well. The Last Dollar Road is usually passable in a passenger vehicle between June and September when it is dry. It is not advisable to do in a passenger car after heavy rains. It is a great route to explore.. Enjoy! 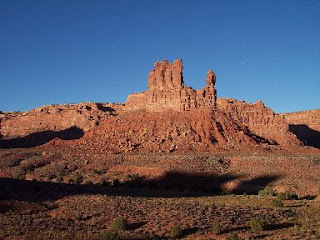 The Valley of the Gods is situated in Southern Utah south of Moab, off of Highway 163 less than 15 miles south of the town of Bluff, Utah and north of Mexican Hat and Monument Valley. I use the Cadillac RV Park in Bluff as my jumping off point in this beautiful area. 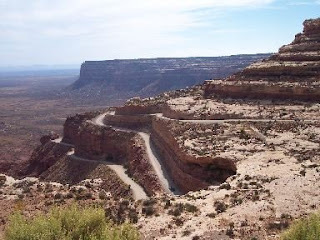 The Valley of the Gods road stretches 17 miles between Hwy 163 and Route 261. You can start either direction but I prefer starting on the east at Hwy 163 and heading west. This is definitely red desert land and the colors seem to change throughout the day. 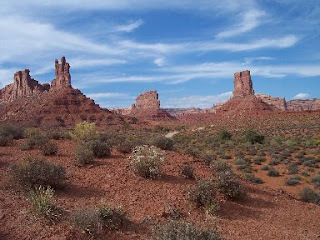 There are many buttes, spires, and monuments throughout this area. This is BLM land and there is dispersed camping at different spots along the road. I have seen RV's within the first couple miles of the east end of the road. I am not sure that I would take my RV much further than that. There are several washes that the road passes through, which have always been dry when I visited. Monument Valley can be seen in the distance from parts of the road. The quietness the last time I took this road was almost as deafening as the sights were beautiful in every direction. 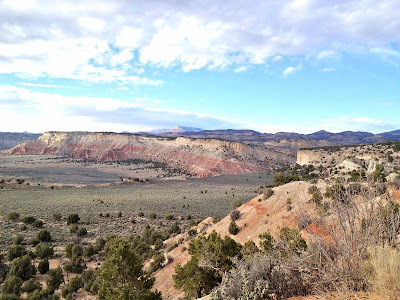 Once you reach pavement of 261 if you go right, it will take you up to the top of Cedar Mesa on another unpaved windy road to a turn off for Muley Point Overlook. The 5 mile road out to the overlook is not as good as the Valley of the Gods road but still passible on the main drag by passenger car. 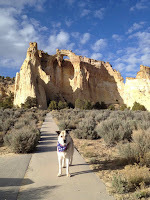 It too is on BLM land with dispersed camping The views at the point are great. 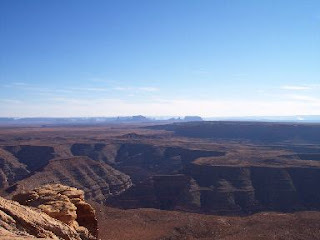 You can see the Goosenecks State Park and Monument Valley from here. You can continue on 261 to the Natural Bridges National Monument, the drive is not very scenic or go down the way you came and visit the Goosenecks State Park on 261 before you meet up with 163 again. Monument Valley is a nice place to visit while in the area but it is on Reservation land and there is a charge to drive the unpaved road through the area. It is a bustling place but still neat to see. The Valley of the Gods has great desertscape without the bustle. Want to get away from the hustle and bustle of the city, the tour buses and over crowded scenic overlooks? Don't mind a little shake, rattle and roll, not having cell service or an inch of dust inside and outside your car? If you said yes to both of these questions then theses drives are for you. 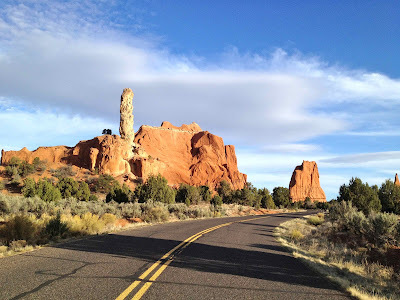 This blog is strives to highlight lightly traveled, scenic, unpaved roads that can be reached by regular passenger vehicles. I wouldn't take a vet or any other low rider on these roads, but what most of us drive should work fine. What we mean by lightly traveled is we passed less than 10 other cars on the road on the day we took the drive. I usually sightsee on week days. If you only sightsee on weekends your experience may be different. Some of these roads will be within National Forest or National Parks and may require a usage fee. Often they have 'self pay' stations. Pay the fees, obey all signs, don't go in closed areas, stay on the existing roads, don't deface the trees or rocks and leave the area cleaner than you found it. Why some people think that they need to express their love or that they were there by carving it in a tree or rock, I don't get. It destroys the trees and the beauty of the area for the next guy and nobody really cares that you loved Jill when you were 16. We encourage responsible back country usage so that these areas will still be out of the way havens for generations to come. We are not attempting to give technical touring 'milepost by milepost' information on these areas. We are just 'highlighting' these drives. Be sure that you have a local map with you at all times and note that any mileage mentioned by us is approximate. We do want to hear from you. We want to hear your experience on the roads we have featured and any changes that may have occurred since we visited. We also want your suggestions for unpaved scenic wonders in your area that we can try out. To email, click on the About Me tab and then click email. You can receive updates to this blog site by subscribing to the site via one of the major readers (see Subscribe to Posts) or via Email (Subscribe via Email). 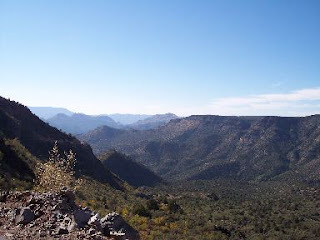 Wow, what a cool 'off the beaten path' drive tucked away in central Arizona. I took the Fossil Creek road trip on the recommendation of Mister Windshield who fixed my RV's windshield ding and gave me the area scoop all at the same time. The west entrance to Fossil Creek road (FR 708) starts about 10 miles outside of Camp Verde, AZ at Interstate 17 on Hwy. 260 and continues 26 miles to the small town of Strawberry, just west of Payson. I started from out from Distant Drums RV Park in Camp Verde. I was a bit disappointed the first few miles of road. There was a lot of wide open spaces with some scrub brush, cacti and Yucca and a couple of dry creek beds with broad leafs that were just starting to change. I resolved myself to the fact that I was just to late in the year to see what I thought was 'the' creek flowing. As I kept driving the terrain began to change and become a little more hilly and had more vegetation. Finally I came to a Tonto National Forest sign and a turn off that stated the Verde River and a Power plant were 6 miles ahead. I took the turn off and found the creek. What a beautiful creek! Clear cool blue water, rapids forming dozens of little waterfalls. What was once open scrub land was now forest albeit with cacti mixed in (it is still Arizona). I think the only other place I have seen water like this is in Glacier National Park. The creekside was a great place for lunch and some exploring. I never made it the 6 miles down to the power plant and to the Verde river and the Hotsprings. I was told that the Hotsprings was a place where nudist sometimes hang out. I have nothing against nudist but I hadn't had lunch yet and didn't want to chance it. I was throughly enjoying the scenery were I was. There were many pullouts and dispersed camping sites around the creek area. 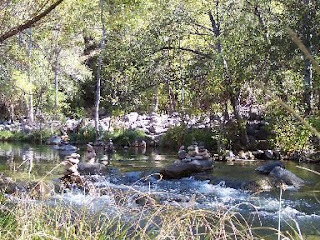 One area along the creek, which looked as if it could double as a swimming hole, curiously had cairns stacked all around and in it. Empty on my visit, it sort of had a mystical sense about it. Just me, the water the weird cairns and dozens of butterflies. Further up the road I ran into a curious older man on a horse with two pack horses for the second time. When I went back to the main road and continued to Strawberry there were many more pullouts and campsites along the creek. The blue water thrilled me each time I got a glimpse of the creek. Finally the road started winding out of the valley and up the mountain side. The views were great. I made it back to Hwy 260 in Strawberry where the pine trees were everywhere. The next small town towards Payson was Pine. I found this to be a nice place to stop and check out a little gallery. I continued further and stopped at Tonto Natural Bridge State Park. I found it scenic enough and would have explored more if there had not been a huge bus of school children also exploring the park. Now getting late, I headed back to Distant Drums via Hwy 260 which climbed back through the pine forest to the high desert scrubland. It was a fabulous day trip. Fossil Creek Road is unpaved and washboard a lot of the way, (more so on the west side than east) but easily passable in a passenger car on the main drag. For the more adventurous drivers there were many inviting off shoots that would have required 4wd and high clearance. I did not check them out. This was a very scenic and enjoyable drive. I did this on a week day and only passed 4 other cars (and the unusual horseman). 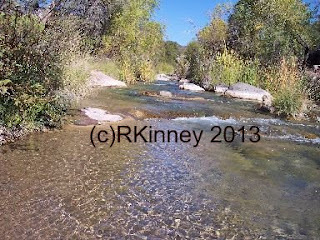 I hope to do this trek again, maybe in the spring when the all the dry creeks are flowing and yuccas blooming. Next time I will allow more time, do some of the hiking trails in the area and maybe even venture to the hot springs. Note: I went to drive this route in April 2012 but apparently they are reconstructing a bridge over the creek and you can not get all the way through to Strawberry from the route starting at Hwy 260. There is signage at the beginning of the route by Hwy 260 & you can get down by the river & creek this way just not loop back to Strawberry for the moment. April was a little early to see all the Yucca & Prickly Pear in bloom but there were a couple small patches of poppies. This Blog strives to highlight 'lightly traveled' unpaved scenic drives around North America that do not require a 4wd or high clearance vehicle. North America is blessed with an abundance of beautiful scenery. Not all of it can be reached via the pavement and thankfully, a lot of it cannot be reached by motorized transportation at all. 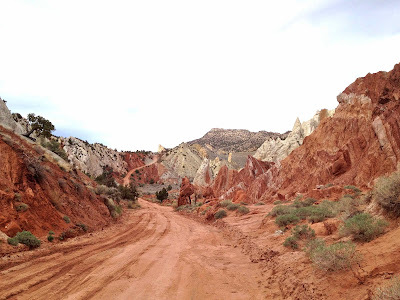 If you are like me and need to get out of the concrete jungle to keep your sanity and you don't mind a little dust, jiggling, ruts or rocks to see some beautiful country you might check out one of these drives. We also want to hear your unpaved, less traveled scenic drive suggestions so we can check them out when we get to your area. Check out the "About this Blog" post for more info on the type of roads we are highlighting. All text, photos, graphics, and artwork on UnpavedRoadsLessTraveled is copyrighted and may not be published, broadcast, rewritten or redistributed without permission. UnpavedRoadsLessTraveled encourages responsible back country use on existing trails and roads.